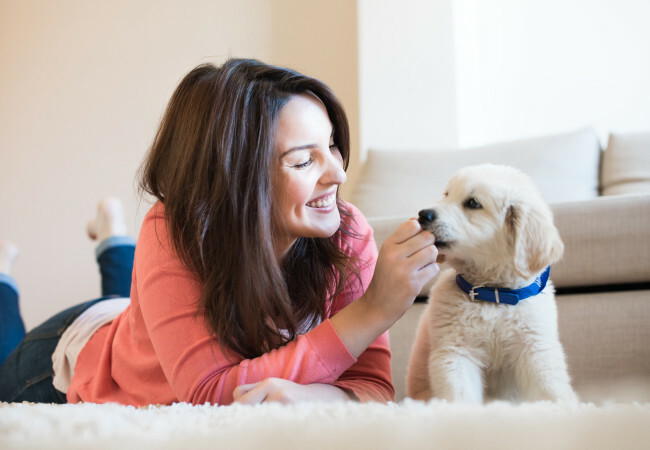 As a responsible pet parent one of the first things you will want to do before bringing your new pet home is to ensure your home is safe for your new furry family member. Be it a cat or a dog there are a few things you can do to make the transition into pet parenting easier for everyone involved. Having a pet is similar to having a baby who is on the move or a toddler in the home, so getting down to floor level to look for things that may spark their curiosity is a good first step. Fencing – Is your fencing secure with no holes or gaps for a small puppy to slip through? Is the fence high enough? Some breeds of dog (even small ones) can scale a surprisingly high fence and be off like a shot. Cats of course can easily jump fences, so never expect your cat to stay in the backyard unless you erect a cat containment system to protect them. This can also be a good idea to avoid them harming any native wildlife and can also help to avoid costly vet bills from animal fights and any accidents that might occur if your pets are roaming the streets. Plants – dogs and cats will often chew plants in the yard, and there are a number that will cause contact allergies such as wandering jew. Some common plants that cause problems when chewed include yesterday today and tomorrow, poinsettias, lillies, aloe vera, oleander and sago palm. There are other plants that can be toxic when ingested and the toxic effect may be cumulative, so identify the plant and ask your veterinarian if your pet seems to be eating anything out there. Dogs will commonly eat blood and bone and other fertilisers, and can get very sick from this. Garage – just as you wouldn’t let your toddler into the garage with toxins around, make sure there is nothing your pet can eat in there, particularly rat and snail bait, fertilisers and antifreeze. Put these up high or in a locked cupboard. Rubbish Bins – if you have a large pet make sure they don’t have access to where you keep the rubbish bins. They will likely tip it over making a big mess and even eating food scraps with possible hazards such as bones and other foods that can be harmful. The kitchen is a great place for adventure for a new puppy or kitten. You may need to visit the baby-proofing section of your local hardware store to get cupboard locks and of course securing the bin will be a priority too. Power cords can be a hazard for chewing puppies and kittens, and there are some neat cord tidies that can be placed around cords to protect your cords and pets. Be aware that treats and food stored in the kitchen need to be safely tucked away, as we see many cases of bloat from dogs getting into the food supply and overeating. Power cords should also be secured in the main areas of the house. The key to pet proofing is to banish clutter, anything on the floor and at dog or cat height is at risk of being chewed, after all your puppy can’t be expected to know the difference between a chew toy and your remote control or iPod! For cats especially it can be a good idea to make sure you secure any ornaments and other objects on mantles and windowsills. Cats like to sit up high watching the world and may end up knocking over or breaking that sentimental piece you have sitting pride of place. If your house is carpeted, consider setting your new puppy up in a playpen or setting up baby gates to restrict access to the carpeted areas of your home while they are toilet training. Storing away your clothes and shoes in the wardrobe or drawers is the best fix if you don’t want them getting destroyed by your new fur child. Some breeds are more prone to chewing however it’s better to be safe than sorry. The same goes for kids toys. A new puppy or kitten can’t tell the difference between a child’s toy and that new Kong toy or squeaky mouse you got them yesterday. Anything that could easily be ingested is a hazard to a new pet. In particular watch for things that have button batteries, as these are extremely dangerous should they be ingested. You will also need to consider anything that your curious pet may get their head stuck in, like empty bags. Cats especially like to get inside bags and boxes and unfortunately suffocation is a very big risk for pets. Bathroom cupboards should be secured with child locks to secure any cleaning products or medications. Many pets will try to drink from the toilet, so keep the lid down to avoid any accidents. Keeping your home clean when living with pets doesn’t have to be hard. On top of regular cleaning, ensuring you keep up to date with pet vaccinations and other preventative treatments can help to avoid any infestations of parasites such as fleas, ticks and worms that might hop aboard your new pet and make their way into the home. For those with less time to remember there are products available now such as Bravecto for dogs, that will give your pet cover for up to 3 months for flea and tick prevention. Staying on top of these treatments will help to keep your home parasite free and safe for the whole family. Even if you have the most pet proofed home a bored dog will probably still find something they shouldn’t get into to have some fun. If you will be away from your pet for any length of time make sure you give them something to keep them occupied. Kong toys filled with steamed sweet potato and liver treats are a great way to keep them amused. If your pet is getting up to mischief while you are out, consider putting them in a kennel with a run or large pet crate to keep them contained while you will be out this can ensure the safety of both your home and your pet. Removing Pet Hair at Home – Go From Furry to Fur-Free!